F. Turner is one of the names on the Bottesford ‘church list’ of WW1 Servicemen. Frederick William Turner was born in September 1878 in Speldhurst, near Tunbridge Wells, Kent, the oldest son of William and Martha Turner. William Turner was a gardener who came from Ashurst in Kent, where he was born in 1853. Martha (neé Patch) was from Norton, Somerset, born in 1849. They married at Christ Church, Battersea, on the 19th August, 1875. After Martha’s death (after 1911), William Turner remarried, leaving Bottesford to live at Hayes, Middlesex. By the 1881 census the family had moved to Bottesford and lived on Easthorpe Road. The 1891 census also records them as resident on Easthorpe Road. There were now four sons, all at school: Frederick W. (aged 12), Louis Henry (aged 11), Ernest (aged 10) and William (aged 8). There was also a boarder named William Sopp, a 21 year old groom from Kirdford. Sussex. William Turner gave his occupation as a gardener. Kelly’s Directory for 1908 records that Mr William Turner was the private gardener to the Rector of Bottesford,Canon William Vincent-Jackson MA JP. He also worked for the Duke of Rutland and earned the rare distinction of having a variety of chrysanthemum named after him. A W.Turner listed as a bell ringer in the belltower of St Mary’s, Bottesford, was probably this same William Turner, father of Frederick. However, by 1901, Frederick Turner had left home and moved to Harrow-on-the-Hill, Middlesex, where he lived as a boarder at 3 Byron Terrace, employed as a Post Office clerk. By the 1911 census, he had moved again and was living in a boarding house at 16 Strensham Road, Balsall Heath, Birmingham, still employed as a postal clerk. 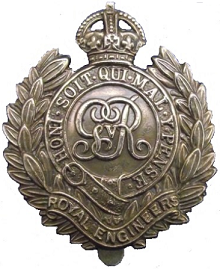 Frederick William Turner first enlisted on the 26th October 1908 in Birmingham as a Sapper in the Royal Engineers, presumably as a part-time reservist. In these pre-war years, he completed annual two-week periods of training. After completing his initial four years contracted period, he re-enlisted on the 21st November 1912 for a further four years. When he attested in 1908 and accepted by the Royal Engineers with Service Number 274, he was 30 years 3 months old, living at 83 Gladstone Road, Sparkbrook, Birmingham, working as a sorting clerk and telegraphist at the Post Office. He attested for a second time at Tunbridge Wells on the 26th December, 1914, giving his father William Turner of Easthorpe as his next of kin. He was initially graded as a skilled telephonist with the rank of Sapper, then re-classed on the same day as a Lance-Corporal with the Motor Company. His record states that he was re-mustered and promoted to Corporal on the 12th February 1915, and drafted into the BEF on the 4th October, 1915, having been judged to be a skilled telegraphist on the 28th August. He embarked from England on the 28th November 1915, and joined the Cable Section on the 18th December (location not stated but probably in France). On the 5th April 1916 he was a Corporal in the 32nd Signals Company, but reverted to Sapper on the 16th May that year, after being severely reprimanded for being ‘absent from a picket mounting parade’ in July 1915, and again on the 14th April 1916 for ‘incivility whilst on duty’. He was admitted to field hospital on the 12th May 1916 then transferred to England on June 1st and admitted to Reading War Hospital suffering from D.A.H. [the meaning of this is unclear] from the 2nd June to the 18th August, 1916. After convalescing, he embarked at Southampton on the 25th August 1917, bound for Alexandria to join the Egyptian Expeditionary Force, and was posted to Palestine on the 1st January, 1918, joining the Signal Company, Sinai Section, as an Acting-Corporal in May. He was awarded a Bounty payment of £15 on the 7th January 1919. He was demobilised soon after, and left Alexandria on the 25th May, 1919, returning to England via Kashgar. His home address was given as 28 Park Road, Carlton, Nottingham, when he was demobilised, but an alternative address added to another record sheet was 54 Stockfield Rd, Acocks Green, Birmingham. He was awarded the 1914 -15 Star, the British War Medal and the Victory Medal on the 30th May, 1921. There is little information about his life after the end of WW1. No marriage record has been found, and our information is that he died childless. He may have been the Frederick W Turner who died in 1927 in the North Birmingham district, in which case he would have been 49 years old. However, there are many alternative records for men named Frederick W. Turner. One is that he may have died in 1939 at Handsworth, Birmingham, aged 61. We are grateful for the information that we have had from Mrs Barbara Whittard (Ernest Turner’s granddaughter). Thank you also to Jonathan D’Hooghe for his efforts in tracing Frederick’s military service. Date and place of death provisional, pending further information.